Who names a girl Morgan? Jason Richard Wright pondered, A cruel joke, he decided. Morgan was a 23-year old army brat putting in four years of college before transferring elsewhere to work on her masters. A brunette by birth, with an occasional freckle upon her slightly tanned cheeks. She was voted best smile in high school, alongside the charming (though half witted) Josh Braunson. When they had their photograph taken, they were asked to "put on that smile that made you famous" and to "turn to each other." It was with that Morgan commented, "Do you want the smile or the pose?" Naturally, this remark flew over the meticulously trimmed and sprayed head of Josh Braunson who proudly confirmed, "I can smile from any position." Morgan lightly commented, "That's suppose to surprise me?" Again, her words were lost with his ears. 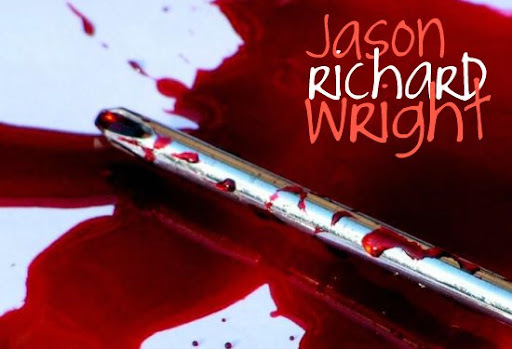 Jason Richard Wright was a modest, young man. He was shy and had a smile that cracked under pressure of use. He was harmless to the eyes, ears and was easily offended. But, he seldom lost his cool. He was notorious for taking insults with a shy turn of the head and bashful lower of the eyes. Jason Richard Wright was a hopeless romantic. He kept his eyes peeled for that one girl who would change his world. He knew that somewhere out there, amidst the cosmos, was a girl with his name carved into her forehead. They were both just waiting for that chance encounter, that moment. The moment when they would cross paths and they would just know. I walked to my destination with a freshly pawned gun in pocket. I was ready. Stanley didn't know what was gonna hit him. I came up his street, Brookridge, and noticed his house was dark. He wasn't even home. I had it all planned out in my head of how it would go down, but my scenario always involved him being home. This was going to be too easy. I figured I'd just waltz right in screaming his name and waving my gun in his face, making demands. That would scare him into submission. At least, that was my theory. That was my plan. After some reuben on rye and coffee, I was home. I crashed on my sofa, having made my choice of whiskey from bourbon and lemonade. I sipped and slowly washed away the memory of Holly. The memory of Maxim. The memory of what seemed to be ghosts. I shouldn't care, I barely knew her. The more I drank, the less I did. Eventually, I had forgotten and was fast asleep. I woke near dawn, the room was dark and I heard noises from the kitchen. I looked to the door, it was shut and locked. I wanted that gun now more than ever, but I knew that the cops were probably processing it as evidence at this point. I grabbed my whiskey bottle and sipped the last little bit of it; held it upside down from the neck and slowly rose to my feet trying not to make a sound. The radio turned on and I could hear the sound of the intruder fumbling through the AM waves looking for a station to fit their desires.